These are old people. 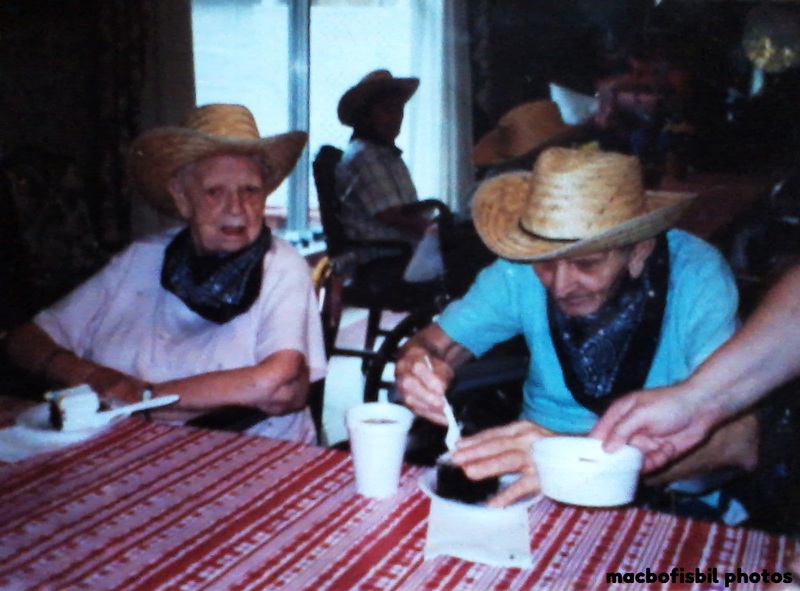 Wearing straw hats and eating chocolate cake. They are in a nursing home and seem particularly happy, especially the blue shirted elder. My mom helps people like them on a daily basis, like she has been doing for the past 25 years. She is always busy because these people are demanding and quite helpless. Not one day is easy, trying to get by with a slim paycheck that can pay the bills and leave not much left over. Which is why not paying for high priced cable or satellite is better than not watching popular shows for absolutely free on Netflix or bootlegged Internet sites. My mom has never been particularly excited about working at this place; there are always fights, messes, and people ready to kick the bucket. But she has managed to work through it all and still trudges through the days, wearing her blue smocks, not getting much recognition for her dedication, other than a thankless tag. I wish she could have done more. If she would have gotten a college education she surely would have done better than a certified nursing assistant (aka professional buttwiper) and my life would be so much more livelier and richer. But I’m still grateful for everything I have though. At least there’s a sturdy roof over my head (and a decent flat screen to marvel at football games every week with my uncle). Why are these old folks wearing straw hats? Maybe there’s a special occasion going on. I doubt they are still living now; this picture was taken at least five years ago, because it was originally a Kodak print lying on the floor and snapped by my phone. And we stopped having actual glossies of photos a long time ago. It’s because these people, aged 70, 80 or so lived their long, memorable lives, ended up in a nursing home, and got this picture snapped of them that now will be forever immortalized on the digital interface of the globe. And I feel like their lives should be given some justice, some degree of importance.